I was reading about the difficulties the City of New York was having when it comes to migrating off of the Palantir platform, while also reading about the latest cybersecurity drama involving ransomware. I’m spending a lot of time studying cybersecurity lately, partly because they involve APIs, but mostly because it is something that is impacting every aspect of our lives, including our democracy, education, and healthcare. One thing I notice on the cybersecurity stage, is that everything is a much more extreme, intense, representation of what is going on in the mainstream tech industry. Ransomware is software that gets installed on your desktop or servers and locks up all your data until you pay the software developer (implementor) a ransom. Ransomware is just a much faster moving version of what many of us in the software industry call vendor lock-in. This is what you are seeing with Palantir, and the City of New York. What tech companies do is get you to install their software on your desktop or servers, or convince you to upload all your data into the cloud, and use their software. This is business 101 in the tech industry. You either develop cloud-based software, something that runs on-premise, or you are a mix of both. Ideally, your customers become dependent on you, and they keep paying your monthly, quarterly, or annual subscriptions (cough cough ransom). Here is where the crafty API part of the scheme comes in. Software providers can also make APIs that allow your desktop and server to integrate with their cloud solutions, allowing for much deeper integration of data, content, and algorithms. The presence of APIs SHOULD also mean that you can more easily get your data, content, and algorithms back, or have kept in sync the whole time, so that when you are ready to move on, you don’t have a problem getting your data and content back. The problem is, that APIs “CAN” enable this, but in many situations providers do not actually give you complete access to your data, content, or algorithms via API, and enable the true data portability and sync features you need to continue doing business without them. This is vendor lock-in. It is a much friendlier, slower moving version of ransomware. As a software vendor you want your software to be baked in to a customers operations so they are dependent on you. How aggressively you pursue this, and how much you limit data portability, and interoperability, dictates whether you are just doing business as usual, or engaging in vendor lock-in. One thing I’m hopeful for in all of this, are the vendors who see transparency, observability, interoperability, and portability of not just the technical, but also the business and politics of delivering technology as a legitimate competitive advantage. This means that they will always be able to out maneuver, and stay ahead of software vendors who practice vendor lock-in and ransomware, whether of the slow or fast moving variety. 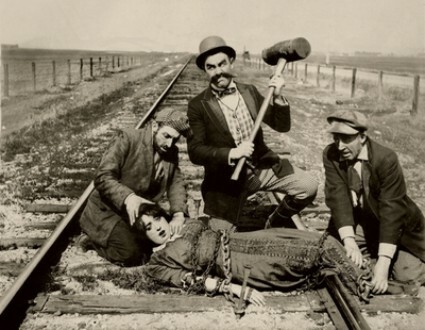 Photo Credit: Ford Sterling with the sledgehammer and Mabel Normand tied in the rails in Barney Oldfield’s Race for a Life (1913), from moma.org.